Are you thinking of applying for graduate jobs or internships? Then this event is not to be missed! 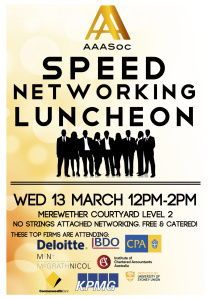 Meet representatives from the world’s largest professional services and financial firms like Deloitte, KPMG, Commonwealth Bank of Australia, BDO, McGrath Nicol and more! If you are thinking of completing a CPA or CA qualification, you can discuss your future career development opportunities with representatives from The Institute of Chartered Accountants and CPA Australia. This event is FREE and CATERED! See you there!